Another day, another spray. I worked on the body all day again today in preparation for an after-dinner body filler spray. That's all the rage these days, so I hear. After some conferences with Hunt and Brownie, I decided to change the front wheel well bevel that I worked so long on a few days ago. I was worried that the concavity of the surface would push the wheel into the body a little too much, which is not what we want. 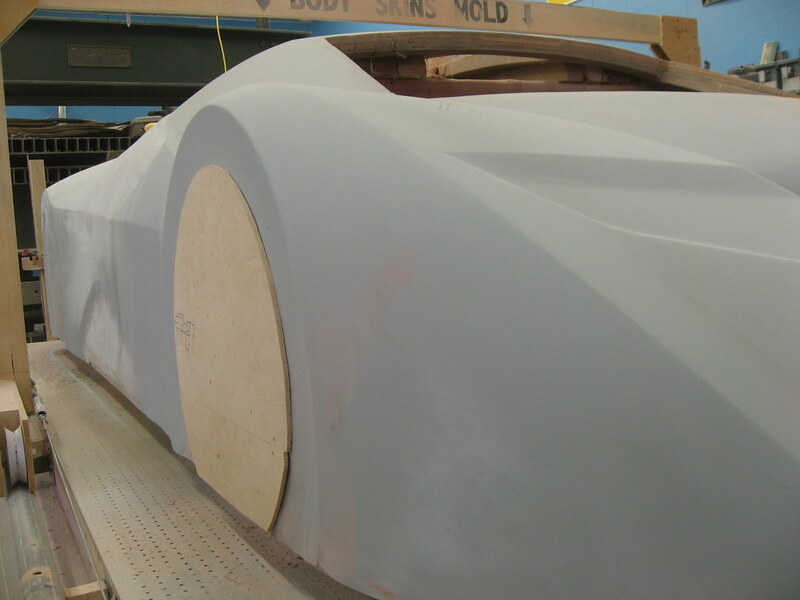 I had originally planned for the concavity due to the satin finish we were planning for the exterior. In using a less reflective surface than is normal for cars, I was looking for ways to make the surfaces have contrast and pop. I think it actually looks better the way it is now, even without the wheels on it, so I will chalk that one up to knowledge gained through experimentation. I am going to let the body filler dry while I go in and watch a movie/fall asleep. Aaron and Zac worked today on the floor for the new shop. They welded in all the joists and have begun the subfloor. It's going to be a nice one.